Art patrons can submerge themselves into the never-before-seen world of the Sweet Somaling children. The gallery exhibit introduces whimsical creatures that are in part human, animal and plant at the Fine and Performing Arts Building. Sarah Fox is an artist and teacher from San Antonio, whose work is part of a new exhibit titled “Sweet Somalings,” displayed on the second floor. The works include installations, wax castings, mixed media, paintings, stop-motion animation and music. Fox births her children into a world where beauty is redefined and the possibilities of biology are limitless. “[I had] ideas of these little genetic mistakes and what they would look like,” Fox said, describing her creations. When entering the exhibition, art patrons will notice the unique forms of the Sweet Somaling children. Some may feel as if they are transported into another world where the air changes and their steps become lighter. In the background, a melody plays. “Honey Finn Wax,” works by Sarah Fox, an artist from San Antonio on display in the Sweet Somalings exhibition in the Fine Arts Building Thursday evening, Sept. 14, 2017. Students Austin Jasso (left) and Bianca Alonzo look at a painting titled “The Vegan” by Sarah Fox, an artist from San Antonio on display in the Sweet Somalings exhibition in the Fine Arts Building Thursday evening, Sept. 14, 2017. The composition is paired with Fox’s stop-motion animation located toward the back of the room which takes a viewer through her experiences and healing. Fox explains that her process begins with a collage, then from there she chooses what medium to use rather it be animated, wax sculpture or painting. Her unique style originates from her childhood experience. As a child, she was sick and had to have several surgeries which she says challenged her to redefine her standards of beauty from conventional ones. Fox says her inspiration is, “About being in a body that doesn’t function the way a healthy body does” and her later attempts to have children resulting in miscarriages. “The young characters, like the little piglets and the little wax boys, those are kind of me imagining what these children may have been able to look like if they were able to live in some other world where the rules of gravity and the rules of our own biology don’t necessarily hold true,” she said. 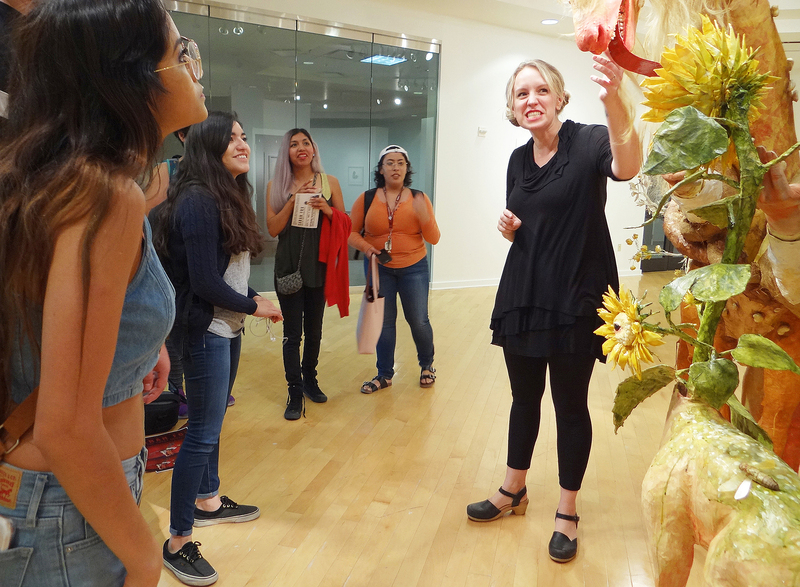 Students attended the opening event Sept. 14 at the gallery. 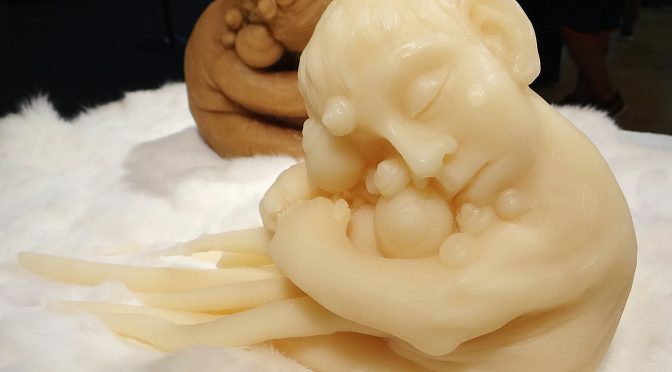 “When looking at the wax characters, I felt almost as if I was in her womb,” TAMIU student Yvette Monic Medellin said. The exhibit will be on display until Nov. 2.